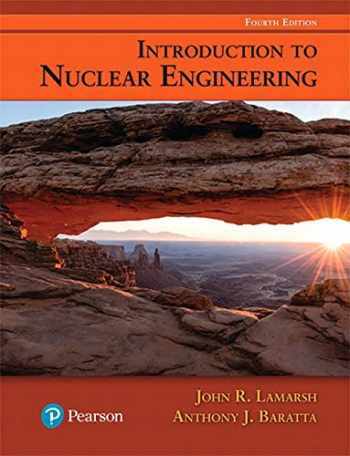 Acknowledged author John R. Lamarsh wrote Introduction to Nuclear Engineering comprising 816 pages back in 2017. Textbook and etextbook are published under ISBN 0134570057 and 9780134570051. Since then Introduction to Nuclear Engineering textbook received total rating of 4 stars and was available to sell back to BooksRun online for the top buyback price of $90.84 or rent at the marketplace. For junior- and senior-level courses in Nuclear Engineering. Applying nuclear engineering essentials to the modern world Introduction to Nuclear Engineering , 4th Edition reflects changes in the industry since the 2001 publication of its predecessor. With recent data and information, including expanded discussions about the worldwide nuclear renaissance and the development and construction of advanced plant designs, the text aims to provide students with a modern, high-level introduction to nuclear engineering. The nuclear industry is constantly in flux, and the 4th Edition helps students understand real-world applications of nuclear technology—in the United States and across the globe.